ATP Chengdu & Shenzhen as the Men's tour moves to Asia for the next 3 weeks. A new stop off on the ATP tour this season for this 250 points ranking event played on outdoor hard courts and temperatures around the 30• mark all week and live coverage on Eurosport from Friday morning through to the final. Top seed Dominic Thiem comes into this event as the second favourite at 4/1 and is bypassed this week due to his exertions in Metz last week at the Moselle Open where he looked out on his feet having reached the final losing to home favourite and rising talent Lucas Pouille. To back this form up for consecutive weeks after the gruelling season Thiem has had, will surely be beyond the very durable Austrian. My selection this week is the number 2 seed Nick Krygios who is ultra talented and plays in a tournament that looks well within his grasp. He plays in the trickier bottom half of the draw which is why his price is as big as 100/30 with Coral. 4th seed and fellow big server Feliciano Lopez 9/1 and the inconsistent Victor Troicki at 16/1 standing out as the main obstacles on route to the final. Krygios at 15 in the World has the beating of both, as he does of his first match opponent in round two Kevin Anderson after receiving a bye in round one due to his high seeding. Anderson at 10/1 is a very dangerous floater on paper, however, is still feeling the effects of injuries that has plagued him since his quarter-final run to the US Open in 2015 where he beat Andy Murray in the fourth round of course. Anderson the big-serving South African is down at 45 in the World at present having been top 10 late last season and is way short of his best form, this should be a good warm up for our selection Krygios in midweek. The top half identifying a potential finalist opponent for the Aussie Bad Boy looks between two players. The unreliable 3rd seed Grigor Dimitrov is playing his way back into form and has had success on the Asia swing previous campaigns. He is yet to win a title since Queens on the grass of London prior to Wimbledon in 2014 and he must be favourite to reach the final however is very unreliable and frustrating, where he is still shy of the form shown by Krygios should they clash in the final. For value seekers Albert Ramos-Vinolas, the 5th seed is a huge price at 33/1 with Ladbrokes where he is as short as 22/1 with Coral. At half the odds to make the final I certainly wouldn't put anyone off the versatile Spaniard in the weak section of the draw. Tomas Berdych looks the rightful favourite to defend his title here in Shenzhen for this 250 points ranking event. The Berd Man is coming back into form having had a poor season from his usual high standards being one of the most consistent players on tour over the past decade. Down at 9 in the rankings, he will look to finish strong and secure yet another end of season ATP World Tour finals in London come November. Berdych loves this event having won last season without dropping a set. His draw looks kind with his path including 4th seed Bernard Tomic 8/1 who struggles in the humidity of Asia and is out of form. Potential semi-final opponent impressive younger Alexander Zverev who is the 5th seed and last week's St Petersburg Champion beating Berdych in a close deciding set. That extra days rest and acclimatisation will be a factor plus the fact Berdych is on his favoured terrain it is likely Saturday's result would be reversed, however, I don't see Zverev being able to sustain his form for two weeks having switched continent and playing out a gruelling 3 set final with Stan Wawrinka only on Sunday teatime so a weaker semi-final opponent is more likely. David Goffin 11/2 the 2nd seed looks the chief threat for the title ranked just 5 spots below Berdych at 14 in the World, the Belgian reached the semi-final of Metz losing for a third consecutive time to eventual champion Lucas Pouille. Goffin has no form in Asia in the past and conditions should far suit Berdych this week anyway so the 7/2 with Coral will do nicely for a successful defence by the Czech star. 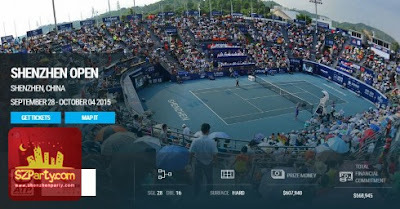 ATP Chengdu - Nick Kyrgios to win Outright @ 100/30 Betvictor & Coral. ATP Shenzhen - Tomas Berdych to win Outright @ 7/2 Coral.